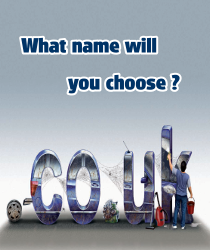 Our site offers a complete resource for domain name registration and management, from personal to corporate and our pricing structure is one of the lowest in the UK. We provide a simple all-in-one web based solution for all your domain name needs. Services like unlimited web and email forwarding help you to focus your web presence and define your place on the Internet. ..... it might be too late tomorrow! Domain names registered by or transferred to eXtendnet can be used with any of our great value fully featured iNFINITY web hosting plans. Alternatively if you do not require a web hosting plan, see details of the features and services, like web and email forwarding included with the FREE˚ to use iNFINITY Domain account. All domain names are accessible from anywhere in the world, there is no performance difference between top level domains (TLDs or extensions). The main difference is in that .com's are perceived as being international and .co.uk's are seen as being UK based. If your company has an international market a .com domain would be a good choice whereas, .co.uk is ideal for companies primarily focused upon the UK. .biz, .com, .info, .net, .org and .tv domains can be registered for between 1 and 10 years, .co for between 1 and 5 years and all other domains can only be registered for 2 years at a time. There are considerable advantages in registering your domain name in multiple extensions, protecting a brand name or making it easier for visitors to find you regardless of the domain extension they enter. Note:.co.uk, .ltd.uk, .me.uk and .org.uk domains are registered with Nominet, the UK Internet names organisation, and will be registered on your behalf on the understanding that you have read and accept their terms and conditions.